The custom-built contemporary colonial house at 600 Catamount Road sits on a property of more than nine acres abutting the municipally owned Brett Woods Open Space. FAIRFIELD — The landscape of Fairfield’s northernmost region more closely resembles a melange of Kentucky and Vermont; verdant open meadows and rolling hills. This is the town’s bucolic horse country. Nestled among the barns, pastures and upscale farmhouses in this rural setting there is a custom-built house at 600 Catamount Road that looks like it was plucked from a European countryside and placed in this Greenfield Hill neighborhood. The cream-colored contemporary colonial is not visible from the road, but it is worth the trip passed the gates and up the long, crushed stone driveway to see this timeless treasure on its 9.5 breathtaking, private acres. Although this is not a horse property, it certainly could be with its acreage and its private access to Brett Woods Open Space, the municipally owned land reserve of 185 acres, which enjoys miles of hiking and bridle trails. As it is currently configured, this house combines with its beautiful property to create an elegant year-round or weekend retreat. 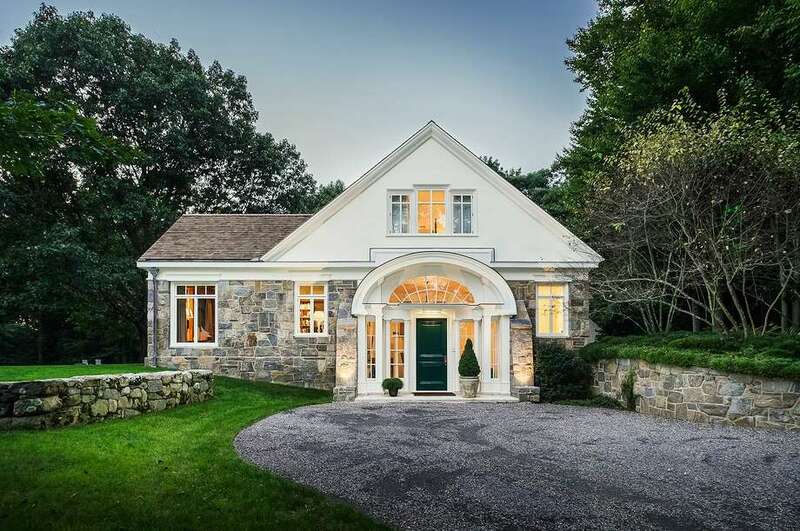 The beautiful facade of this stone and clapboard house, capped off with a gable cedar wood shingle roof, is matched by the beauty of the property — dotted with deciduous trees and large open fields, and the beauty found within its 6,694 square feet of living space. The house was built in 1996 with the perfect blend of modern and traditional styles, and every room enjoys stellar views of the outdoors through oversized windows. Despite the time period in which it was built, this house actually is well-suited to today’s lifestyle of sophisticated and casual living and entertaining. It was given many features to augment that style. It has a spacious, combined living room and dining room for large gatherings. It has two offices, one of which has its own half bath and sound-proofing for privacy. The full partially finished lower level features a sound-proof, high-tech 500-square-foot media or theater room and a 1,000-bottle wine room. All 13 rooms are unified by the home’s attractive molding and millwork. Outside, there is a crescent-shaped in-ground swimming pool surrounded by a stepped waterfall, attractive stonework, a bluestone patio, and a grotto. Indoor-outdoor living is enhanced by this home’s porches, covered and open, accessed from several rooms. Enter the front door framed by sidelights and a large arched transom into the two-story foyer, which is unlike most. The listing agent calls it “a statement foyer,” and it is. It has a marble floor and a staircase up to the living room on one side and a long, wide marble gallery on the other side. It also leads to the living room, although less directly. The living room has a fireplace and a door to a covered porch, and the dining room features two floor-to-ceiling built-in, sleek china cabinets and a built-in buffet topped with granite. At the back of the house, there is a spacious gourmet kitchen, sizable butler’s pantry with glass-front cabinetry and a wine cooler, a large breakfast room, and family room, the latter of which has a fireplace and door to a patio. The kitchen features a long center island with a breakfast bar for four, a backsplash of square white ceramic tiles, and high-end appliances including a Viking Professional six-burner range. Bibliophiles, take note: This house has ample built-in shelving including in one of the offices, family room, in a long center hallway, a back hall, and even the kitchen and breakfast room. The current owner has stacked the kitchen shelves with culinary books and uses the breakfast room shelves as a display for a teapot collection. On the second floor, there are four generously sized en-suite bedrooms. The master suite has two full baths, a dressing room, tons of closets, and room that could be a sitting room, office or nursery. There is also a door to a private balcony. One of the baths has flooring and a backsplash of glass tiles, a jetted tub, and heated towel rack. In addition to the wine room and media room, the basement also has a large cedar closet. For more information or to set up an appointment to see the house contact Karen Waldvogel of Al Filippone Associates/William Raveis Real Estate at 203-209-0870 or karenw@afahomes.com.